The best your mouth can imagine! 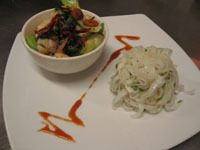 This stir-fryed squid dish was adapted from a recipe in "The Mezzo Cookbook" by John Torode . I really like this Chef's style. It is simply presented, but full of flavour. "Fish should smell like the ocean. If they smell like fish, it's too late.."
On a cutting board, cut the squid tubes down one side and open up so it lies flat on the board, with the outside of the squid facing down. Score the squid in a criss cross pattern and using a sharp knife. Slice into length ways strips about 1cm/ ½ inch wide. Cut the pak choy length ways into 8. Cut the capsicum in half, de-seed it and cut the halves into strips. Slice the onion. Heat the oil in a frying pan or a wok on high heat, add the squid and stir fry for about 2 minutes until it starts to color. Add the onion and quickly fry, then add the pak choy and capsicum and stir until they start to soften, then the garlic and ginger. Add the sauce, quickly stir in and serve into bowl immediately. Top with chopped coriander. I like to serve with rice noodles, pad Thai or similar. Be rewarded! Join RewardsCentral today!